Announcement Creating goddess rocks, altar stones and spiritual art is my way of sharing Universal Love Energy! Back in 2012, when my husband and I were living on the river, I had a vision inspired by nature to create spiritual, goddess, and altar stones to share peace, love, light, and blessings with the world . I started out as the Simplified Witch, the original goddess on stone artist, which has evolved into RocknGoddess which I feel is a more appropriate name for my art. Each piece contains a heart which represents Universal Love Energy. Creating spiritual art is also my way of sharing my late husband's eternal love. Please enjoy browsing my listings as well as sold listings and stop by often to see my new creations. If you see something that I made and sold in the past and you would like me to make it for you, please do not hesitate to message me. I am also happy to modify any design per your request, create a custom order, or personalize with a message on the back of the stone. 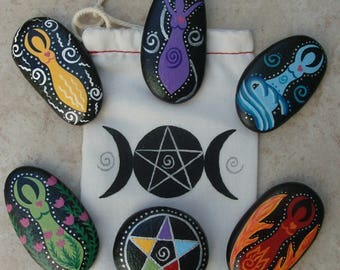 Creating goddess rocks, altar stones and spiritual art is my way of sharing Universal Love Energy! MADE TO ORDER Wheel of the Year Altar Stone Wiccan Witch Pagan Celtic 8 Sabbats Samhain Yule Imbolc Ostara Beltane Litha Lammas Mabon. Many years ago I was gifted with a beautiful God & Goddess stone set. They were definitely handpainted to perfection. I have been using them with Divinations/Altars since 2014. I always wanted to know where they came from. As I was recently window shopping on Etsy, I found these Stones. They were perfect for a new travel Shrine I was creating. When they came, they have a different marking on the back in comparison to my original ones - but then I noticed the Artist with the same Initials. Although these are now new to me...It's like I've connected with them for years. Thank you so much for being the most sacred artist that you are. I am so happy to finally know who created the one's I've been with for so long..... Blessed be. I love these so much! They are beautiful and perfect! Thank you! Tree of life stone was inspired by a similar memorial stone I created for a friend who passed away. Like nature's seasons, this stone represents the different seasons of life. God and goddess set with pentacle and bag. Grab it now it won't last long! Elemental goddesses with pentacle amd bag ready to ship! Grab it now it won't last long! I always loved art but got away from it for a long time. In 2012, my husband and I had the opportunity to retire, down-size, and move to a home right on the Delaware River. We would go down to our dock and take strolls along the shore. I found the stones to be very vibrant and energizing so I decided to bring a few home and paint them. Then I painted more....and people liked them and asked me to paint some for them....so I did. I began to sketch and turn my sketches into paintings on stones. Painting stones had transformed my life. I found my peace and calm. I found what I was supposed to be doing in this life and I was loving it. Then in 2015, tragedy struck. My husband was killed in a traumatic accident along the river. My world was shattered. The last 3 years have been difficult but I have found my way back to collecting and painting stones. This time, with even more passion and spirituality, as each stone represents a piece of my heart, love, and light that I have been blessed with. It is my hope that I can share that love and light through my art. Each piece of my art contains a heart which symbolizes Universal Love and the eternal love and light of my husband's spirit. I needed to take a terrible thing and turn it into something positive and good. He knew how much I loved creating art, how happy it made me, and he would want me to continue sharing my creativity, talent and happiness with the world. So here I am. Loving life everyday and living it to it's fullest. Life is short, do what you love and share that love. I create spiritual, goddess, and altar stones to share peace, love, light, and blessings with the world . Each piece contains a heart which represents Universal Love Energy and the eternal loving light of my late husband. Welcome to my shop! Nature is my creative inspiration. I collect river and creek stones that draw me to their vibrant energy which I use to create hand painted spiritual stone art. It is my hope that my art will bring peace, healing, love, happiness, and positive energy to others, as well as inspire living in harmony with nature. All designs are property of the owner, Marcia Stewart, and are to be used for personal use only. Reproduction and use of any designs of this shop are prohibited from being copied. If you are not happy with your purchase, please contact me. If you wish to have a refund for the item, it must be returned in the same condition that it was sent in withing 14 business days. The buyer is responsible for the return shipping charges. Refund will be made for the merchandise, but not shipping costs. Payment is required before item is shipped. I accept credit card payments directly through Etsy as well as Paypal. An order may be cancelled before shipment. If item is shipped, once received, you may return it for a refund within 14 days, buyer to pay shipping costs. Items that are already made are shipped within 1-3 business days of your payment confirmation. My goal is to ship items quickly and packaged well. CUSTOM ORDERS require additional time to ship and a timeline will be discussed with Buyer. Items sent first class mail should arrive within 6-10 business days. Any package over 13 ounces is shipped by USPS Priority Mail Flat Rate boxes and arrive within 1 to 3 days. INTERNATIONAL SHIPPING - I use USPS Priority Mail on all international orders. I can generally fit two or three items in one small flat rate box and would be happy to combine shipping for one single price of $$ as long as your order fits into one small box. This shipping cost does not include any duty fees or expenses that the receiving country may apply to your package. Buyer is responsible for fees levied in their country. If you wish to change the shipping methods in any way, please contact me. Also, if you want to purchase more than one item, I combine shipping to give you a better price on mailing expenses. If an item is shipped but not received, please contact me. Any item shipped Priority Mail is automatically tracked and may be traced.